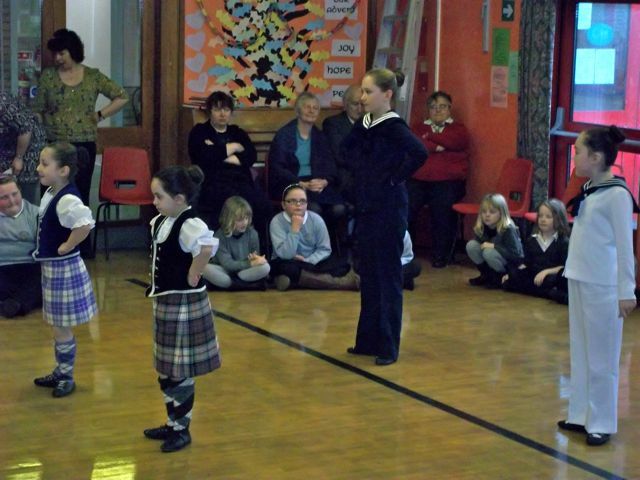 On the 25th January it was Robert Burns day, so Port Ellen Primary had a traditional ceilidh! Robert Burns is a famous Scottish poet and he has written loads of poems in the past. Everyone in the school had learned a Burns poem and 6 got through to the final, we had 2 people come in and judge us. For p1-Ciaran Middelton p2-Rebecca Morris p3-Natalie Logan p4-Ross Thompson p5-Abbie Morris p6 Maisie Logan and for p7-Liam Campbell. Mike Russel, the scottish minister of education came to our burns lunch and ceilidh. Everyone had fun dancing traditional dances and we all sung Old Lang Syne. There was musical instrument solos, and we even had highland dancers. For a traditional lunch we have, haggis. 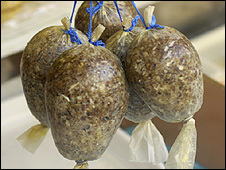 Haggis is a meat, made with sheep insides in it! Everybody likes it and they serve it with neeps and tatties (turnip and potatoes). 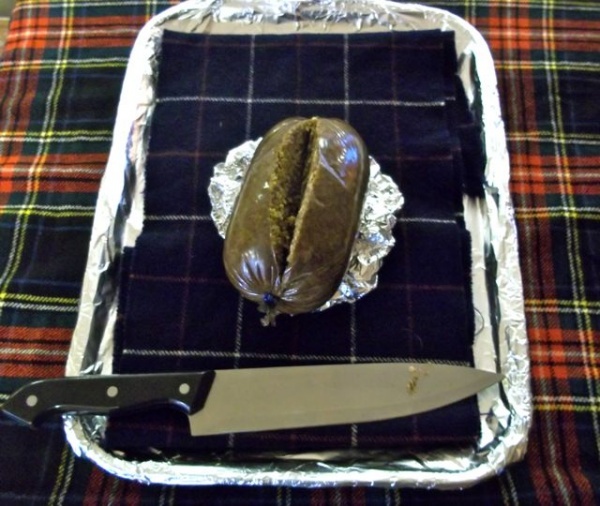 We all say the address to the haggis, while they cut into it. Everyone had a great afternoon and everyone enjoyed listening to the poems! As part of a competition run by Tesco, we have been writing our own versions of this Burns classic in P45. Here are 2 great versions of the poem written by Abbie and Harry. The king of gleaming feast. My bonnie lass just cannae wait. Your puddins gushing out with spice. It was a celebration of Robert Burns on 25th January at Port Ellen Primary School. Children had spent weeks learning their poems to recite to the eminent judges on the day, and we couldn’t wait to see who won. We stopped early for lunch, which included the traditional Haggis, neeps and tatties. 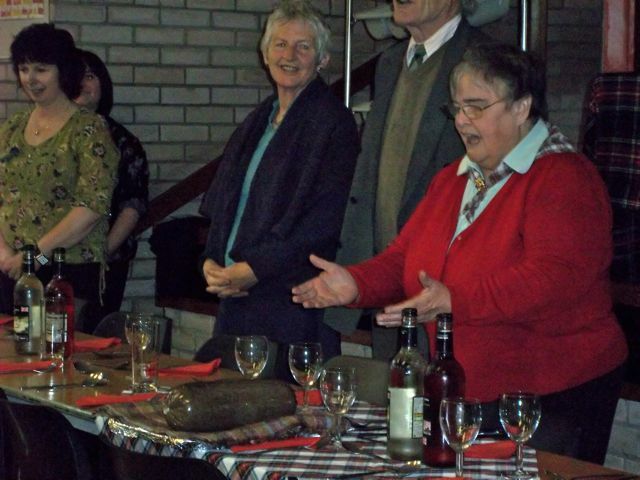 Mrs Carmichael said the traditional Burns lines over the haggis before it was served. After lunch we held a ceilidh with parents attending for a dance and a song. Aileas entertained us on the fiddle, and the Highland Dancers were amazingly springy as they danced. The children have all been learning dancing, and it was great to see them dancing with their parents and friends to the Gay Gordans and Canadian Barn dance. The winners of the poetry competition were announced and were Murray in P1,Bronagh in P2, Abbie in P3, Maisie in P4, Ellen in P5, Aileas in P6 and Eilidh in p7. All in all a fantastic celebration of Scottish Culture.